Several months ago my family doctor suggested I read some of Dr. Caldwell Esselstyn’s online material about a whole foods / plant-based diet and consider changing the way I eat. I had just been diagnosed with an incurable blood vessel disease affecting heart and lungs (pulmonary hypertension resulting in congestive heart failure). It was an unpleasant diagnosis to say the least. After a referral to cardiology, some prescription medicines were added or adjusted to cope with symptoms, particularly fatigue and shortness of breath. But I didn’t want to just cope with symptoms. I wanted to get well. I asked several like-minded friends to pray with me about this, knowing the Lord wants me to be healthy, strong, able to do whatever he needs me to do every day. And so, after reading through multiple website pages and medical research, I have made this change. I no longer eat anything “with a face.” That means no meat, no fish, no eggs and no dairy. Dr. Esselstyn recommends no oil and no nuts and I eat little of those now, as a rule. Instead I eat more green leafy vegetables, more whole grains and rice, more beans and peas, more potatoes white and sweet, more corn. Whole foods. Little to no processed foods like white flour, white rice or white sugar. At the recommendation of my son, I ordered a supply of dehydrated vegetables, especially beans and peas. These are already cleaned, cooked and then dried, which speeds up meal preparation time a great deal. Instead of several hours to cook a pot of dried beans, it now takes me about 15 minutes. I don’t cook with very much salt at all, just sprinkle a little over anything that really needs it. I’m not a fanatic about all this. If I’m eating out with friends, I choose a vegetable meal and don’t agonize about whether there is oil or sugar cooked in the veggies. After two months I’ve lost about 13 pounds. My blood pressure is way down, so much that I can eliminate some of my BP meds and hope to eventually cut them all out. Amazingly, I no longer need the arthritis medicine I’d taken for 50 years! And coffee – although I’ve been a coffee drinker all my life, 4-5 cups a day, I just don’t think about it very much now. One cup when I first get up in the morning, maybe one more during the day, but sometimes after the first few swallows I forget to drink the rest of the cup. Breakfast: one whole-wheat waffle, several chunks of canned pineapple and half of a fresh banana. One cup of coffee. Mid-morning snack: handful of corn chips. Water. Lunch: red beans, collard greens cooked with slices of green pepper*, red-skinned potato salad**. Also, one-third of a baked sweet potato, tossed green salad of lettuce, tomatoes, bell peppers, onion, celery slices with a tiny bit of olive oil and splash of red wine vinegar and a sprinkle of Mrs. Dash (the original salt-free variety). Water to drink. Mid-afternoon snack: couple of graham crackers, coffee. Supper: potato-corn-cabbage chowder***, four whole wheat crackers, water. * Fresh collard greens washed well, sliced then chopped small, cooked in unsalted vegetable broth with several slices of green bell pepper laid across the top. The pepper absorbs the strong collards odor while cooking and may be eaten. Microwave on high 10 to 12 minutes, sample to see if done enough to suit. Cook several more minutes if needed. ** Several small red-skinned potatoes, scraped, diced and cooked in the microwave with salt and pepper, sprinkle of Mrs. Dash. When done, add tiny bit of salad dressing with pickle relish, mix well, mashing slightly. Add chopped onion, bell pepper, and/or celery if desired. Eat while still warm. 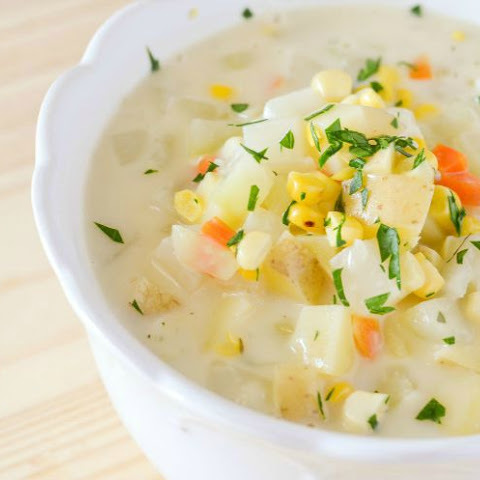 *** Three red-skinned potatoes, diced (washed but not scraped or peeled), one rib of celery sliced fairly large, small wedge of cabbage thinly sliced, small amount of sliced yellow onion, handful of frozen yellow corn, can of creamed corn, salt, pepper, Mrs. Dash. Add water until dish is about half-full of water. Combine in large casserole dish, leaving cover ajar, microwave on high for 10 minutes, stir and taste, cook several more minutes until potatoes and celery are done. I usually prepare enough for two meals, perhaps add fresh sliced tomatoes, cucumbers or peppers, pickled beets, perhaps a slice of whole-wheat toast. Some days I cook brown rice, black beans or corn on the cob. Also I often use canned diced tomatoes, frozen vegetables such as garden peas, green beans, broccoli, turnips, or yellow corn, and various frozen fruit such as peaches and blueberries. I keep my salt intake low because of blood pressure and never have eaten much sugar. My one favorite food is bread, unfortunately, but since switching from white bread to whole wheat, I find I like the taste of it, toasted. Just don’t eat two or three slices at a time for a snack any more. I’m learning as I go, of course. And so far so good. I have not missed eating meat, I’m never hungry, and one really good thing – I don’t have to count calories.